Compared to a few centuries ago, there has been a marked increase in autoimmune disorders. These disorders tend to be more common in women. Scientists and researchers have still not been able to pinpoint the actual cause of the development of autoimmune disorders although many recent studies indicate it may stem from what is termed “leaky gut syndrome”. The conventional methods of therapy sometimes further aggravate the symptoms of these disorders, which is why one may opt to explore the treatment of these degenerative diseases through Traditional Chinese Medicine (TCM), specifically with acupuncture. There is no historical evidence of an “autoimmune” theory in Traditional Chinese Medicine, however, these disorders are diagnosed and treated according to the 8 Principles of Chinese Medicine and of course, the flow of energy termed as “Qi”. 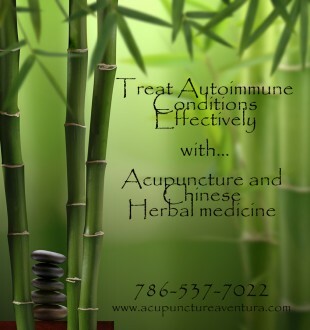 Autoimmune disorders respond very well to acupuncture. And they respond extremely well when you couple it with sound nutritional and lifestyle guidance. Regarding the use of acupuncture. this is basically inserting needles in the area of interest with respect to Qi. A restriction in the flow of Qi causes imbalance in the body which results in the onset of diseases. Manipulating points according to this energy help facilitate the movement of Qi and help circulate blood. Studies have shown that acupuncture coupled with diet and lifestyle changes can have a significant impact on the health of those suffering with an autoimmune condition. We have seen powerful, amazing results with patients in our clinic. These disorders can be treated effectively with Chinese Medicine. If you have an autoimmune condition, do yourself a favor and explore this modality of treatment. Like I stated earlier we have seen some amazing results. Herbs have been part of Chinese medicine for more than 2000 years. These concoctions are designed not only by specificity of the disease, but also by the requirements of the patient. Some patients require stronger herbal formulas for battling a disease whereas others might feel better with a mild formula. We usually prescribe herbs to boost one’s digestive strength and overall immune function. Ancient Chinese medicine has a belief that diseases can be either “hot” or “cold”. According to this classification, a diet plan is set, i.e. hot diseases require food that contains cooling herbs and cold diseases require food that contains warming herbs and spices. Other supplements to boost the digestive system or for cell detox may also be incorporated into a treatment plan. An appropriate form of exercise is necessary for tackling almost all diseases. Qi Gong is an ancient Chinese art that integrates physical posture, breathing techniques and focused intentions. This method of exercise is known to have significant importance for the treatment of autoimmune diseases. Tai Chi and relaxing meditation or yoga helps as well. The conventional method for the treatment of Rheumatoid Arthritis is to alleviate the symptoms of pain and inflammation without actually doing anything to tackle the disease itself. Chinese medicine, on the other hand, works on reducing pain and inflammation. Positive results of acupuncture can be expected whether the disease is chronic or acute. A unique combination of herbs is designed to specifically fit the needs of an individual patient along with a diet plan that promotes healing. Usually, in Rheumatoid Arthritis, food that is cooked with spices like ginger and cayenne. All of this, combined with some form of exercise has shown to improve conditions like Rheumatoid Arthritis by a large scale. Traditional Chinese Medicine deals with Multiple Sclerosis by addressing the root cause of the disorder, as well as treating the symptoms, strengthening the spleen and nourishing the liver and kidneys. Acupuncture proves to be an important alternative to conventional methods of treatment. Multiple Sclerosis mainly affects the spleen, liver and kidney. Acupuncture and combinations of herbs such as Cang Zhu and Yi Yi Ren are used to strengthen the spleen and concoctions made with Shu Di Huang and Sang Ji Sheng proves to be effective for liver and kidney deficiencies. Crohn’s Disease is a gastrointestinal inflammatory disease that affects the lower digestive system. The main symptoms of Crohn’s Disease are abdominal pain, fever, fatigue and persistent, watery diarrhea. TCM uses a combination of acupuncture, herbal formulas, dietary supplements and exercise to treat the root cause of the illness. This not only alleviates the symptoms of the disease, but shows prospects of curing the disease entirely. Lupus is an autoimmune disease of the connective tissue that affects the entire body. The most severe effects occur in the kidneys, blood vessels and joints. According to TCM, lupus can be classified as a “heat” disease because the first symptom is usually fever. Acupuncture and many Chinese herbs can be used to regulate the immune system after the onset of Lupus. Eczema is an inflammation of the skin characterized by redness, dryness, itchiness and oozing of fluid from the crusting of the skin. TCM treats this in the same manner as every other disease- by exploring the underlying cause rather than the symptoms displayed. In Chinese Medicine Theory, eczema is a result of disharmony in the internal systems of the bodily elements. Addressing those elements help resolve the underlying cause of the disease. Acupuncture helps to regulate the “heat” generated by eczema and it works best when employed with herbal medicine and dietary care. Psoriasis is an autoimmune disorder that is characterized by the onset of inflamed patches that occur with severe scaling of the skin. Chinese medicine is a highly reliable option as compared to treatments by conventional therapies. Overall, a category of disease like autoimmune disorders poses lifelong threats. Considering a natural alternative for treatment not only shows positive results, but also comes without side effects. At our center in Aventura Florida, we guarantee a sterile and relaxing environment to tackle your disease. Embrace your inner Qi and call us to book an appointment or to verify your insurance at 786-537-7022! We can help!